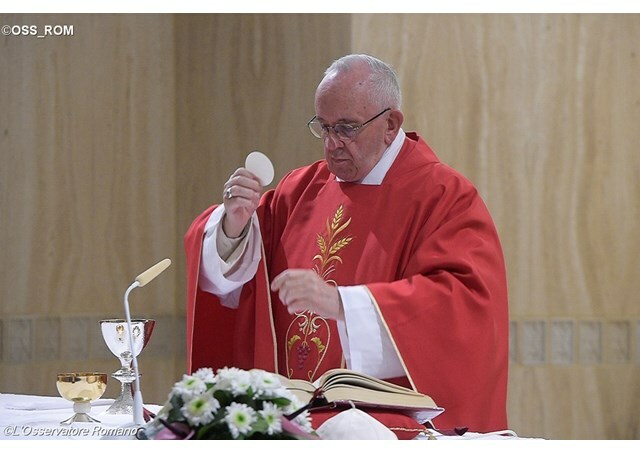 During his homily at Mass on Friday, Pope Francis reflected on how the Devil is the cause of all forms of persecution: from cultural colonization to war, hunger, and slavery. Today, said Pope Francis, we are not only witnessing the persecution of Christians, but of every man and woman, "through cultural colonization, war, hunger, and slavery". But the Lord gives us the grace to fight back and to restore the image and likeness of God that is within us. The Pope went on to say there is another kind of persecution in the world today: the persecution of men and women because they are made in the image and likeness of God. “The Devil is behind every persecution, both of Christians and all human beings. The Devil tries to destroy the presence of Christ in Christians, and the image of God in men and women. He tried doing this from the very beginning, as we read in the Book of Genesis: he tried to destroy that harmony that the Lord created between man and woman, the harmony that comes from being made in the image and likeness of God. And he succeeded. He managed to do it by using deception, seduction…the weapons he uses. He always does this. But there is a powerful ruthlessness against men and women today: otherwise how to explain this growing wave of destruction towards men and women, and all that is human”. Pope Francis described hunger as an "injustice" that "destroys men and women because they have nothing to eat", even if there is a lot food available in the world. He went on to speak of human exploitation, of different forms of slavery, and recalled how he recently saw a film shot inside a prison where migrants are locked up and tortured to turn them into slaves. This is still happening, he said, "70 years after the Declaration of Human Rights". The Pope also reflected on cultural colonization. This is exactly what the Devil wants, he said, "to destroy human dignity" – and that is why the Devil is behind all forms of persecution.